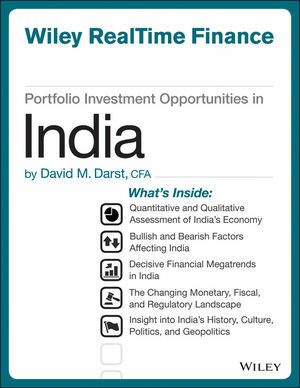 This e-book only investment report will detail India's asset classes, its investment strategies, risks and advantages, and politics and cultural history with an eye toward serving investment advisors and asset managers looking for up-to-date investment knowledge on specific alternative asset classes. David M. Darst (New York, NY) is a Managing Director of Morgan Stanley and chairs the firm's Global Wealth Management Asset Allocation and Investment Policy Committee. He serves as Chief Investment Strategist of the Global Wealth Management Group, with responsibility for Asset Allocation and Investment Strategy, and was the founding President of the Morgan Stanley Investment Group. Mr. Darst joined Morgan Stanley in 1996, after more than 20 years with Goldman Sachs, where he served as a senior executive in the Equities Division. Previous responsibilities with Goldman included serving as Resident Manager of their private bank in Zurich. Darst is the author of four books: The Complete Bond Book, The Handbook of Bond and Money Markets, The Art of Asset Allocation, and Mastering the Art of Asset Allocation. He has also contributed numerous articles to Barron's, Euromoney, The Money Manager, and other publications. Darst is frequently quoted and regularly profiled in the business press including the New York Times, the Wall Street Journal, Reuters, Financial Times, among others. He is a frequent guest on CNBC, Bloomberg, and FOX News, and on radio shows. Darst earned his MBA from Harvard Business School and received a BA in Economics from Yale University, both of where he has served as a visiting faculty member. Darst also holds a CFA.